These mecates are our standard one pattern mecates in a variety of colors and patterns. I decided to separate the standard mane hair mecates from the fancier ones to make finding what you want a bit easier. Any feedback on this change would be appreciated. If you would like to see what can be done with imagination and time, take a look at the Fancy Mecate Gallery. I made this memorial mecate for Marilyn Golden of Aurora, Colo. It is a gray fade using Gray13 as the darkest color and Gray 2 as the lightest color. The black fleck in the lightest stripe is from her horse "Pete." Donna Keagle of Lockport, Ill. asked for a mecate that would match yet contrast with her dark brown horse. The dark stripes in this mecate are a very dark chestnut and the rest of the stripes are off white. I used a light flaxen for the flecks, which adds to the overall effect. This mecate is a bit unusual for me. I don't often combine sorrel, gray and white. In fact I can only think of one other rope I have ever made with this color combination. This mecate belongs to Brad Cameron, mule clinician from Corvallis, Mont. This mecate is different in that it's a pattern I rarely do because of the amount of sorrel in it. At the last minute I changed my mind about splitting up the speckled strands and like how it turned out with them paired up instead. I love this mecate because of all of the different shades of sorrel I used for the stripes. This rope would really set off a sorrel or a bay and would be quite striking on a dark brown or black horse. For Brad Cameron's second mecate, he requested a more traditional sorrel and white that would go with about any mule he would ride. The little white fleck really adds visual interest. Compare it to Kip Fladland's mecate. The two are identical with the exception of the white fleck, yet the ropes look totally different. Although there is a stripe and a few speckles of dark red sorrel in this mecate, it has an overall bright look to it. However, if I had stuck with the dark sorrel rather than using a lighter shade for the other stripes and speckles, it would have had a darker, less flashy look. I did this striking 5/8" mecate for Charlene Andrews in Kent, Wash. This mecate would also look good done in black with shades of gray instead of the dark red sorrel and flaxen I used in this rope. Although it's hard to tell by the photo, I used a very dark chestnut and off white to make up the bulk of this mecate with just a touch of a midrange sorrel as an accent. If I had used flaxen instead of sorrel for the accent, it would be identical to Donna's mecate. Cindy Flynn of DePere, Wis. has this mecate. I just love this little get down rope. The pattern is so simple yet is to great effect. I used a dark red chestnut, a light red sorrel, a strand of flaxen #3 and white to make up the four stripes in this 5/16" get down. This is a very unusual pattern. Or at least it would be for anyone but us. All of the strands are different colors with the exception of the two speckled strands. These mecates usually come about when I'm given free rein and use my left over hair to make something really unique. I like the unpredictability of the pattern. The eye tries to find the repeat of the pattern in the strands, but the different colors make it hard to spot. 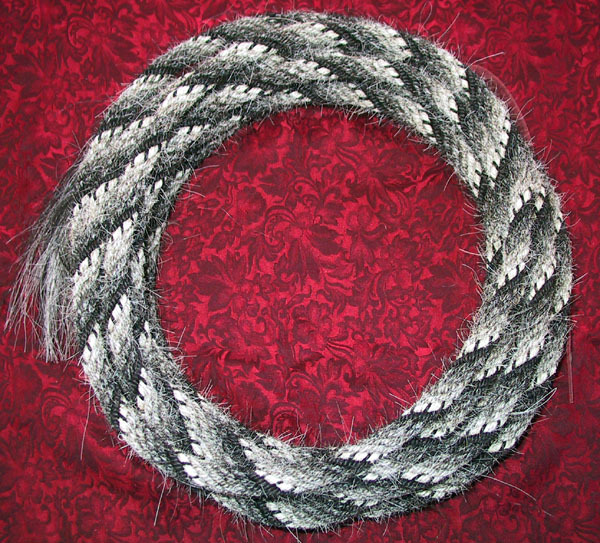 This is a very typical six strand rope pattern with a bit of a twist. Usually you see two blocks of solid colored strands split by a speckled strand. In this mecate I paired up the two light sorrel (actually they are a dark flaxen) strands and the two speckled strands and split them with the dark sorrels. The effect was very light and has a lot of contrast. Another one of my favorites. This 1/2" rope is bright, has lots of contrast and would look good on almost any horse. Although this mecate is done with white hair, it would also look good in off white. I have also done this same pattern in white, gray, and chestnut. Wendy Murdoch in Washington, Va. owns this mecate. Another mecate designed to fool the eye. This one is a bit brighter and I used two sorrel threads side by side in the white strand to make larger flecks. This gives it a bolder look than if I had alternated the threads. Compare it with Charlene Andrews' rope above to see what I mean about the flecks of white. This mecate and the one below it are very nearly the same. I used a slightly lighter shade of sorrel in this rope, and put a sorrel fleck in one of the white strands. This mecate is much like the one above, but I used a black fleck in one of the white strands instead of a sorrel fleck. Compare the two and note how this simple change affected the look of the whole mecate. I made this mecate for horse clinician Buck Brannaman to match a favorite rope of his that I made several years ago. This 1/2" mecate is made with flaxen, dark red chestnut and white. This is a very clean looking sorrel and white mecate. Although its hard to tell, I used two different shades of sorrel in this rope. It is a pair of sorrel #8 strands, one white strand, a pair of sorrel #7 strands and another white strand. In this mecate, I used the same colors as in the rope shown above, but alternated them , one sorrel, one white, and so on. Kip Fladland of Sheridan, Wyo. owns this mecate. This 3/8" two rein mecate is done primarily in a red chestnut, but I put a small dark red chestnut fleck in one of the white strands and a light sorrel fleck in the other to add visual interest. There is a very interesting color in this mecate. I call it sorrel with white. This particular color is usually found on roan horses, but I occasionally see it on sorrels. It is sorrel hair with white hairs mixed in. When I find these types of manes I separate them out of my sorrel hair and classify them by how much white is mixed in with the sorrel and the shade of the sorrel hair itself. I currently have 12 different sorrels with white. This mecate has two strands of this color in it split by a speckled strand. This is a good example of how nice black, sorrel and white can look in a mecate. This one is a 5/16" two rein rope. Buck Brannaman of Sheridan, Wyo. has this 1/2" mecate. It is a very light flaxen alternated with sorrel strands. The sorrel strands have chestnut flecks in them. I would classify this as a fairly subtle pattern. It would be even quieter if I had left out the white flecks, or just used one instead of two. This is a very classy black and white 5/8" mecate. It is also a very uncommon pattern. I took strands of three basic colors; red chestnut, sorrel and white, and put them together in an unusual way. I'm going to let you look closely and see if you can tell what I did in this mecate. I really like this black, white and dark gray two rein rope. There is enough white in it to brighten it up, but the dark gray prevents it from looking too light. This is another of Buck Brannaman's mecates. It is all stripes; dark chestnut, red sorrel and off white. We came up with this 3/8" loop rein for a client who wanted a mane hair rope that would be similar in length to the English reins she was currently using and without the tail of a traditional mecate. I did this very subtle mecate when I was 17 for my first employer, Valerie Shallcross of Dayton, Wyo. It is two strands of black, one red sorrel strand and one strand of flaxen. This is another one of our original mecate patterns. We call this the "Fade." Each strand is a different color. This particular rope is black, red chestnut, dark sorrel, light sorrel, flaxen and white. Saddlemaker John King of Sheridan, Wyo. owns this mecate. I have also done this pattern with black, white and shades of gray, which is also very beautiful. Here is a pretty striped rope I made for Dave Hoffman of Belle Fourche, So. Dak. Black, white, sorrel, red chestnut, off white and light sorrel make up the stripes. I made this gray and white mecate for Barb Pribeck of Kewaunee, Wis. This pattern, when given close scrutiny, proves to be very different. The white and black give it contrast, but that contrast is tempered by the two shades of gray. Very unique. Terry McClare in Maine has this 5/8" mecate. It is off white and sorrel, but combined in a very interesting way. It looks fantastic on her bay horse. I made this striped mecate for Buck Reule of Mandan, No. Dak. He remembered seeing a pattern like this years ago and asked me to duplicate it. I was happy to oblige. It is pairs of white and chestnut strands split by a single strand of black. This is a very traditional six strand pattern that is often seen done in black, sorrel and white. I did this 9/16" mecate in red chestnut, sorrel and white instead. This is a very bright little two rein rope. The largest part of it is light sorrel. I then added a stripe of off white and put a dark sorrel fleck in the other off white strand. I really like this 3/8" get down rope. I particularly like the effect of the dark sorrel strand caught between the two strands of light sorrel. The white stripe really brightens this rope. This 9/16" mecate has a very unusual pattern. I offset the four sorrel stripes (one is a light red chestnut, one is a mid range sorrel and the other two are a dark sorrel) with a solid black strand and a black strand with a white fleck. I really like how it turned out. This is another mecate I made while still in high school. Note the mystery braid popper. Chuck Reid of Arizona owns this one.